Post poems that utilize set patterns of rhyme or metrical scheme, stanza formats, and/or refrains. Fixed forms such as Ballades, Blank Verse, Haiku, Rondeau, Senryu, Sonnet, Swap Quatrain, Tanka, Triolet, Villanelle and poems inspired by fixed forms are welcome. Please state the form, metric or rhyme scheme used in your topic description for the benefit of critiquing and post a tag line either in the title description or in the beginning of your thread stating your desired level of critique. That can be done by simply using a series of stars for light (*), medium (**), or full (***) critique. Post poems that utilize verse composed of variable, usually unrhymed lines having no fixed metrical pattern. Typically, these would include unstructured poetic forms often called FV (free verse) or FF (free form). Please post a tag line either in the title description or in the beginning of your thread stating your desired level of critique. That can be done by simply using a series of stars for light (*), medium (**), or full (***) critique. 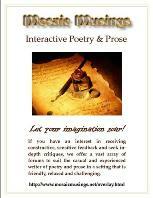 This forum is designed to both educate and exercise your minds to the various styles of poetry. 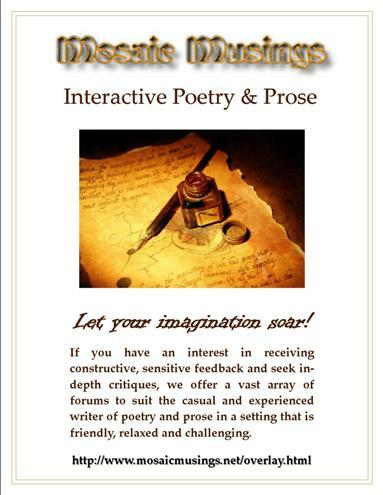 When posting poetic forms, please provide a brief description, its parameters and an example in your topic. Thank you! Post your short stories, chapters, articles, letters, essays, obituaries, reviews, eulogies and journals here. Please post a tag line either in the title description or in the beginning of your thread stating a desire for critique. That can be done by simply using CR vs NC with a series of stars if light (*), medium (**), or full (***) critique is desired.. This forum is designed to both educate and exercise your minds to the various aspects of writing the short story and novel. When posting here, please give a brief overview with examples so others may learn and grow. Thank you! Unleashing chaos, can you conquer Pandora on her random quests and rise above, leading your Muse to victory? There's only one way to find out! Join in when the box opens here. The BOX is now open. Participate in our weekly 'Times Ten', bi-weekly 'Flash Jams' and '60/100 Word Drabble' challenges here! You may also post your own challenges too. All forms of writing apply. Come on in! Perhaps you too will reach the status of 'The Ancients', full of wisdom and character! JAM with us this weekend in our Flash Session - hosted by Cleo_Serapis! 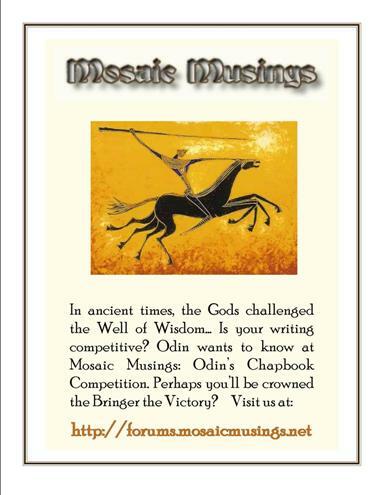 Will you conquer Odin's love for the battle on his quests and demonstrate prominence, leading your Muse to victory? There's only one way to find out! Join in when the battle begins here. This competition is currently on hold. InterBoard Poetry Competition Community - hosted by Web Del Sol. 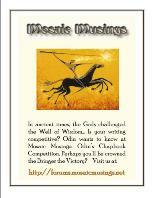 MM is a proud member board of this monthly poetry competition amongst an elite group of forums participating on the net. Nominate a poem today! In this forum, you'll find the latest news about our members and the Mosaic. Come on in! Inside this category, you'll find sub-forums containing gereral site information, forum FAQ's, suggestions for improvement, resource links and articles. Inside this category, you'll find sub-forums for general announcements, discussions, words of wisdom, famous works and member biographies. Enjoy! This forum is for works of an adult-oriented theme. A minimum of 50 posts is required in order to access this forum. *Some posts may be moved into this forum that are suggested beyond the terms for public reading. Inside these tiles, you'll find polished works of our Mosaic Members and therefore, replies are disabled. These works are copyright protected. Members can opt to move entire threads from our workshop forums into these showcase forums, or they can post only the revised works with a link back to the workshop thread for further commentary - the choice is theirs. If you wish to discuss a work in any of these forums, please PM the member directly. Inside this category, you'll find an archive of forums that include poetry & prose for critiques from our past, plus all weekly and monthly challenges, as well as our chapbook & holiday competition tiles. Your feedback is very much welcomed in these archives. Enjoy!